Being a fresher, you might not have much experience about precise ways of behaving and responding in an interview. But, this does not mean that you have to struggle a lot to stand out number one among others! Even if it is your first ever job interview and you really desire to make through it, don’t panic. It is because you still have the time to practice with the emulating Mock Interview Questions and Answers ahead of time. Mock Interview is an imitation interviewing session of an actual interview, which can be conducted by anyone who has little knowledge about the respective industry of candidate’s interest. The interview tries to emulate an actual interview as closely as possible and aims to provide the candidate with relevant experience. With such a session, the candidate can learn and react to situations that are expected to happen during the real interview. Generally, these sessions are videotaped, as the candidate is shown with the tape once the interview is completed. Such interviews can be organized by career services for freshers, or by alumni, or even by friends and relatives. The main focus of the mock interview is to figure out self-knowledge, industry knowledge, behavioural competencies, skills proficiency, and more such aspects of the candidate. 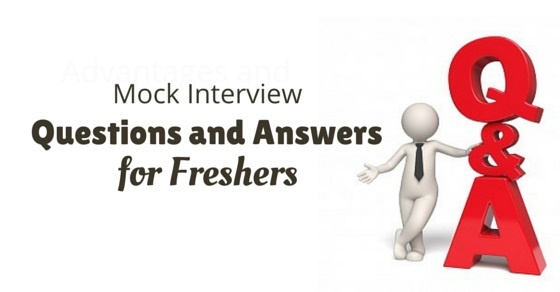 It is an excellent tool to mock practice for an interview for freshers, due to its worth even few experienced professionals prefer a mock interview before they finally go for the genuine interview round. Mock job interviews present the candidates with a fair idea of things and elements that they are going to experience during an actual interview round. An interview is almost similar to an exam. And, the fear of answering unknown job interview questions and meeting unfamiliar faces, normally generate lots of stress. The mock interview offers you a great opportunity to test your responses to such common interview questions. You can even opt to hire skilled interviewer if you wish to secure feedback that is precise yet friendly. If you have someone experienced in the same industry in which you hold interest, then hiring him as an interviewer can be really fruitful for you. You can gain good interview skills from him that help you in the long run. The main aim of mock interviewers is to focus and highlight the candidate’s strength and interview skills. They also focus towards correcting the candidate’s weakness or weak points. As a result to this, candidates get familiar with their strengths and skills and able to secure high confidence level. They, therefore, perform well in their actual interview, keeping in consideration the fails during the mock interview session and few interview techniques. No candidate is absolutely perfect, but a mock interview can help you to comprehend suitable responses to vital questions and also work on your weak areas. In a real interview, there is no feedback given for your interviewing, but the mock interview can be your best opportunity to get prepared for your first ever job interview. If you have given a couple of interviews previously, then such a session can help you understand your flaws that are coming in between of your path to your dream job. Even if you are a fresher, it might happen that the company outlines a behaviorally based interview session for you. Most of the time, company judge behavioral skills of a fresher through their body language. So, as a fresher it becomes extremely vital that you learn the right way to behave and react in an interview. Conducting a mock interview will also help you to learn basic practices and ways that are expected by the interviewer during the actual round. To make sure that you can gain relevant results from your mock interview session, it is essential that the interviewer prepares a set of interview questions to ask during the real interview. Since you are a fresher, so definitely you won’t be asked questions related to experience or your past job. But there are other vital aspects for which you will be tested. So below are few common job interview questions for freshers that are specifically asked during their interview process. 1. How do you manage stress while you are working? Or, have you ever handled a stressful situation? Stress is a vital element on which most freshers are tested. It is because, most of the times, freshers are not able to cope up with stress and, therefore, deliver unproductive results. So when you are asked such a question, it is very much essential that you are prepared in advance for your own, unique stress management techniques. A good answer can be, you speaking about your any past experience during which you effectively managed stress and deliver same or high productive end results. 2. Have you ever worked with a team or do you always prefer to work alone? Being a fresher, you might not have got enough chances to work with a team but make sure you have at least one experience to share when you worked and performed well with a team. It would be great if you were the team leader, but even if you were a resourceful team member, then it will impress the interviewer. Make sure that you portray to the interviewer that you are a good team player. You should also convey that you are equally comfortable working with a team or working alone. 3. If the job requires travelling to distant locations, then will you be able to manage it? Since you are a fresher, so the possibility is that you will have fewer responsibilities to look after. For this reason, the interviewer is always expecting a ‘YES’ to the answer for this question. In case you are not willing to travel due to any personal reason, so it is better that you clear this out during your interview session only. 4. Do you think you are a successful person? If yes, then why, and if no, then also give us a reason? The answer to this question must always be a positive one. You should always consider yourself successful, and this is what that the interviewer is interested in listening. A good explanation for this can be your goals that you have achieved. You can even talk about upcoming goals which you will achieve soon as you are moving on the right track. It is because a person who is able to achieve his goal within his assigned time frame is considered successful by others. 5. What major accomplishments did you achieve during your course study program? Since you are a fresher, so definitely you won’t possess any prior work experience. But surely you must have some accomplishments from your course program to discuss with others. You can speak about any successfully completed project or when you were being awarded for Excel performance in a specific field and more such events. It is because the interviewer just wants to have an idea that whether you were a bright performer during your course study program or were you just another student in the class. 6. Are you aware of prevailing market trends in our industry, and what salary according to market situations, you are expecting? The first portion of this question talks about current market trends. The second portion of the question directly talks about your salary expectations. So as an answer to this question, you can talk about the salary amount that you are expecting from your very first job. 7. Are you willing to learn even from your job? Or, do you learn from your failures or do you forget them easily? It is a very smart question that enables the interviewer to know that you are still open to the learning process, or you have limited your learning journey to your school days only. Make sure you are always open to learning, even when you will become an experienced professional. It is because learning new things will not only increase your knowledge but is also an excellent way to improve on your mistakes and to stand out of the ‘non-learning’ crowd. 8. What would you do if you have to work with an unsupportive and unfriendly colleague? Be well prepared for answering this question. The question aims to understand that are you mature enough to handle cold conflicts arising within an organization. As a fresher, you might not be expected to have much practical work experience, but this something that is genuinely expected from all individuals who are already and who are willing to become part of the professional arena. 9. What are your career goals and what is your idea of achieving them within your set time frame? The answer to this question will solely be yours, as everyone has its own career goals to achieve. Moreover, you should have your own well-outlined plan to make sure that you successfully achieve the goals that you have listed. But make sure that the career goals you wish to accomplish are practical, realistic, and approachable. 10. Will you be able to work for long working hours, in case the job requires? Last but not the least, every organization requires an employee that is flexible in his work approach. It is because there is a time when the company is under stress and when there are numerous projects that have to be finished on time. So, during such situations, the company is expecting employees to work more. Hence, if there is no major issue, then you must be willing to work flexible for the company. Even if you are a fresher with excellent background records, still it is wise if you take advantage of mock interview opportunities. It is because everyone has few points that need improvement and can be excelled.